Biddulph Primary Care Centre has been shortlisted for two accolades at this year’s Royal Institute of Chartered Surveyors (RICS) West Midlands Awards. 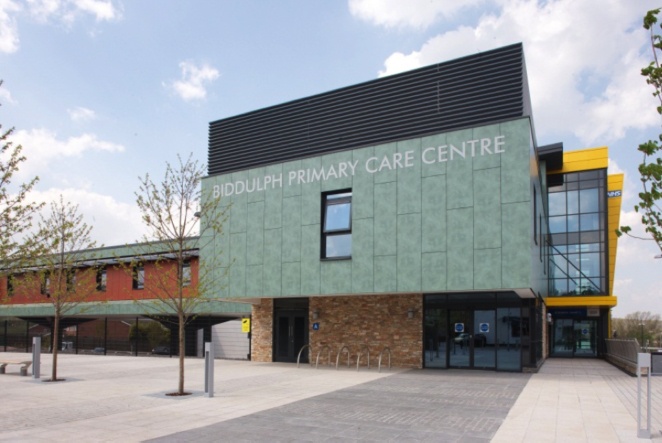 Opened in July 2013, Biddulph’s 3,500 sqm state-of-the-art primary care centre, which is the home to two GP practices, will go head-to-head with other new and regeneration projects from around the region. Its innovative ‘figure-of-eight’ design, which plays on the different heights of land across the site, and its thoughtful choice of materials inspired by the local area has earned the centre a place in the list of finalists for the ‘Design Through Innovation’ category, and the passion shown by the Biddulph community for the centre has also secured it a place on the ‘Community Benefit’ shortlist, with centre staff especially impressed with their workplace. The RICS Awards showcase the most inspirational regional initiatives and developments in land, property and construction, celebrating the achievements of professionals working in both the built and natural environment. The project has been put forward for the awards by Prima 200’s private sector development and investment partner Prime, who last year scooped the top prize in the Community Benefit category for its work on Cobridge Community Health Centre in Stoke-on-Trent, a primary and community care facility which includes pioneering sexual health services and a specialist sexual assault referral centre, so the team will be hoping to retain the title with Biddulph. The regional RICS winners for the West Midlands will be announced at a special ceremony at Birmingham’s Town Hall on 21 May 2015. If Biddulph wins either of the categories it is shortlisted for, the centre will go on to represent the West Midlands in the national RICS Awards in London, competing against projects from across the UK.